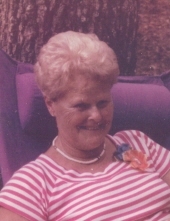 Barbara Jean “Bobbie” Starks, age 80, of Dalton, passed away Thursday, February 7, 2019 at Wooddale Nursing Home. She was preceded in death by two sisters, Lois Flannagan, and Patricia Viggins; sister-in-law, Marie Johnson. She is survived by her loving husband of 61 years, Ben Starks of the residence; daughters and sons-in-law, Mary Starks and companion Terry Dalton, Carolyn and Darryl Overton, all of Dalton; sister and brother-in-law, Christine and Homer Heath of Chatsworth; one brother, Junior Johnson of Varnell; grandchildren, Brandi, Jason, Maleah, Brandon and Kennan; four great-grandchildren, Shyanne, Ryleigh, Jaxson, and Coleman; and nieces and nephews. The funeral service will be held Saturday, Feb. 9, at 2 p.m. at the Pleasant Grove Chapel of Julian Peeples Funeral Home with Rev. Arthur Corbin officiating. The family will receive friends and family at the funeral home Saturday, Feb. 9, from 12 p.m. until the funeral service at 2 p.m.
Burial will be in the Harmony Grove Baptist Church Cemetery.